Ditulis pada Sep 09, 2008 // Wireless. “Hu” or the “Human Element” refers to Cisco’s introduction into new age of information and communication through the internet and networking. This new age has brought forth many advantages and solutions to today’s communication needs. With the coming of revolution more and more people decide to go wireless because it is more convenient and “secure”, or so they think. Well there is no question about it being more convenient, but is it as secure as people claim it is? Read this guide about some of the holes in security of most networks and some easy steps that you can take to improve the security of the wireless connection in your home. Say you have just bought your router along with your new computer that you are planning on using for your small home based business. You set everything up just as your Internet Service Provider (ISP) tells you and think you are ready to go. In general ISPs just provide you with an internet service and are not suited to provide you with tech support for your Local Area Network (LAN). In some cases ISPs agree to provide tech support at an additional price per month and you have to use the routers they give you. These routers are not necessary, as you can purchase your own that would be just as, or even more secure. Administrative passwords are used to secure your router so that no one would be able to access your router’s setup and play around with it. Before you go to any web site on the internet, type in the default network location into your internet browser window. For most router this address is “192.168.1.1”. If it isn’t it for your router, then you should look for it in the user manual that came with your router. Once there a security screen will pop up and ask you for a user name and password. The default for most routers would be something like “admin” for the user name and “1234”,”admin”, or “password” for the password. If upon installation you do not set these then anyone with this general knowledge will be able to access both your router as well as your information. The procedure of changing your wireless network password as well as your router log in and password is very easy and can be done very quickly, however, the benefits that those changes bring are exceptional. Now, instead of anyone being able to access your network and play around with your information, it would take a hacker to so, which are much less in number than your “average joe’s”. fact that the information is the there. In fact anyone with the right kind of equipment can intercept this information or know that the information is being transmitted. So how does the password protection work? Well, whenever you create a password, the router and your computer use that password in order to order to encrypt data according to a series of steps that differ depending on the encryption standard you use. There are several standards which you may have heard of, ranging from the WEP to WPA and WPA2. WEP and WPA in one way or another use an encryption algorithm called RC4 of ARCFOUR. Whenever you enter a password, RC4 develops 2 passwords for you, a public password and secret password using the pass phrase you entered. Whenever you transmit data, the data is encrypted using your private key. Along with that password, an Initialization Value (IV) is passed on. An IV is set of changing numbers that are required to initialize the decryption mechanism in the RC4 cipher. This set of values unlike the rest of the information is sent in clear text thus anyone out there who has the ability of picking up information will be able to catch this set of code. 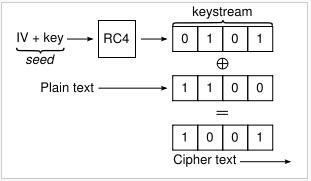 The uses of RC4 differ in encryption mechanisms. The main reason why WEP is not as secure as WPA is because the IV used in the encryption is only 24 bits long, so every 4000 or so packets of information, the same IV number will be repeated. The repetition of an IV is at the very core of the security problem because once these numbers are repeated enough times, the encryption can be cracked. WEP only relies on RC4 for encryption and it is easy to crack (under 3 mins for most cases). This problem was more or less fixed with the introduction of WPA, or so was thought. WPA increased the IV value to being 48 bits long, which means that a value was to be repeated over a period of years not minutes. In addition to increasing the IV, WPA also uses the MAC address of your computer in combination with a set of randomly generated values to encrypt your data. As a response to this issue other methods are predominant in cracking WPA such as packet injection instead of just packet collection as in WEP’s case. WPA’s main vulnerability came from its backwards compatibility. WPA implements only some of the IEEE 802.1i security standard since the RC4 is still the cipher that is used to generate keys. WPA2 is new current standard which implements the most security measures of the IEEE 802.1i standard and makes extensive use of the Advanced Encryption Standard (AES) which does make it incompatible with the older network cards which don’t have the new ciphers as well as other security algorithm such as RADIUS authentication to prevent people from hacking your system. RADIUS authentication relies on a 3rd party to authenticate the user that try to access your network therefore hacking a RADIUS based security system, although not impossible, is very strenuous process. The only downside to that is that you will actually require a server just to sit there and provide authentication. While you are at the set up page it also beneficial to pay attention to your System Set Identifier or SSID. Much like your house which has a specific address, your router also has identifying information that differentiates it from the routers around it. For example, when you are connecting to a network, your computer prompt does not tell you that it is connected to “network”, it tells you that it is connected to a network named “whatever you would want to call your network”. This name is your SSID, your router, by default broadcasts this name into the air so that it could easily found. Routers also by default broadcast the name of the company that made them as their SSID which also makes it even easier to hack. Linksys routers for example, come with the SSID name “linksys”. As soon as I know that it is a linksys router, I automatically know several key features about this router such as the default Password and default Login ID. Good thing here would be to go and change the name to anything that is not related to that company like “Joe’s Network”. It also advisable to hide your SSID by disabling SSID broadcasting in your router options. By disabling SSID broadcast, you are not disabling the router itself, but you are telling your router to stop shouting its name out into the open and telling people come and attack it. Specific programs are necessary to identify hidden networks and not everyone know about them or has access to them. By hiding your SSID it is more difficult for people to come and attack your network, and the number of people that can even attempt to do that is decreased. 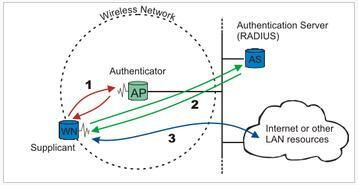 Here is the quick summary of what you should do to make your wireless network more secure. Change the passwords and the names of the network. Also, make sure your passwords are at least 20 characters long made of combination of ASCII characters (a – z, A-Z, 0-9, ~ ! # $ % ^…). Short passkeys are easy to crack. Change your router name. In general security on standard home routers will not stop expert hackers from stealing your data, however, putting those things in place will make your network more secure and harder for people to just take your data. If you can, in any way, avoid using the PSK (passkey) authentication for your network as it is more vulnerable than the other password options.